The road death toll during the New Year holidays rose by 9.5% from last year to 463, even as the numbers of accidents and injuries fell. The election date will likely be delayed from Feb 24 to avoid having poll-related activities overlapping with those of the coronation ceremony, Deputy Prime Minister Wissanu Krea-ngam said Thursday. Commercial 5G services will not be in available in Thailand before 2020 under the government’s plan, as the next-generation mobile system will require a massive infrastructure upgrade with a high degree of collaboration across industries. Thailand’s annual headline inflation rose to a four-year high in 2018, boosted by energy and house rent, but the rate still moved in the target range set by the government. 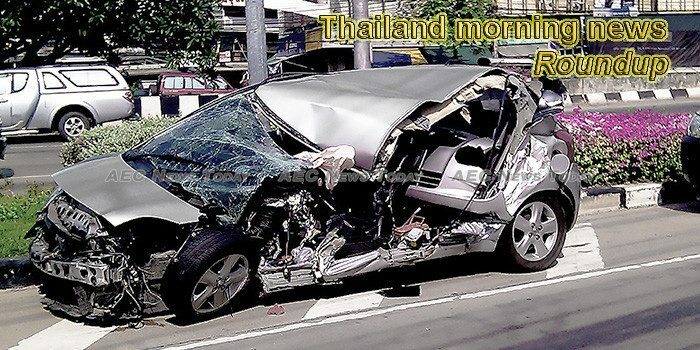 A total of 463 people died and 3,892 others were wounded in 3,791 road accidents over the New Year holiday’s so-called seven dangerous days (December 27-January 2), the Disaster Prevention and Mitigation Departmentâs Road Safety Centre announced. The government will test run 5G services in the Eastern Economic Corridor (EEC) in preparation for the development of S-Curve and new S-Curve industries. The Cabinet has approved in principle the draft royal decree on the expropriation of land for the project to construct the railways connecting the three major airports. Finance Minister Apisak Tantivorawong sees interest rate hikes, capital mobility and political stability after the general election as economic concerns for 2019. The possibility of the scheduled February 24 election being postponed by one month is looming after the government insists that it wants no disruptions for the coronation ceremony in May. After obtaining a Geographical Indication (GI) status in June, demand for the pomelo grown in Kratie’s Koh Trong commune has spiked. The Revenue Department plans to launch a trial run of web scraping, a technique used for extracting data from websites, in order to prevent tax avoidance by pure-online vendors. Residents of a village close to the sea in Songkhla’s Singkanakorn district have moved their belongings to higher ground in preparation for tropical storm Pabuk, which is expected to land in the Southern region on Friday. The Finance Ministry has extended a payment channel that is eligible for the government’s value-added tax (VAT) refund scheme for shopping during Chinese New Year, adding QR code payment to debit cards as originally planned. MOST EXPORTERS are worried about the baht appreciating against the US dollar, fearing it will hit exports and farm incomes amid the slowing of both local and global economies. State telecom enterprise TOT wants to register 40 billion baht in revenue in 2019, a 14% increase from the year before, thanks to partnership deals with major mobile operators and a different business plan. The Board of Investment (BoI) has laid out a plan to attract aerospace investment at U-tapao airport in 2019 as part of the government’s Eastern Economic Corridor (EEC) development. Krabi ferries and tour boats are being banned from leaving port while some national parks are being closed for tourist safety with the approaching tropical storm ‘Pabuk’. An animal rights group is calling for an investigation into the case of two dogs allegedly tortured by an army officer at a military camp and then left to die. Office of Narcotics Control Board secretary-general Niyom Termsrisuk walks reporters through the measures taken with illegal drugs confiscated by police, during a demonstration at the agency’s Narcotics Analysis and Technical Service Institute in Bangkok on Thursday. Thai aerospace is ready to take off with the huge opportunity of maintenance, repair and overhaul (MRO) services, but airline competition will continue to intensify as low-cost carriers broaden their networks. The office space market will continue to be robust over the next two years, with rents breaking historical records and demand expected to rise after the 2019 general election, according to property consultant Knight Frank Thailand. Residential developers should be more cautious with new supply launches in Greater Bangkok in 2019 as the absorption rate declines, leading the number of unsold units to exceed the five-year average, says the Real Estate Information Center (REIC). The government is considering extending its grip on the exports of wood products and mai khud lom — trees grown to a certain size and dug from the ground to be replanted in other places for andscaping — to build confidence of trading partners and increase shipments. Investment sentiment in Thailand’s capital market may turn negative if the general election is delayed until the end of the second quarter or the second half, says the Investment Analysts Association (IAA). The construction market is expected to maintain its growth prospects in the next few years, helped primarily by major public sector infrastructure projects. The 22-kilometre Brown Line monorail project linking Khae Rai in Nonthaburi and Lam Sali in Bangkok worth 48.38 billion baht will be developed under the public-private partnership (PPP) model. Thailand can use blockchain technology for elections, with a hybrid model that combines e-voting in close groups and traditional voting, as Thais still need time to build up digital literacy. Siam Commercial Bank (SCB) and Kasikornbank (KBank) have raised their fixed-deposit rates by 25 basis points, following in the footsteps of Government Savings Bank (GSB), which partly passed through the central bank’s higher rate in December. The Commerce Ministry pledges to shore up key farm products this year if their prices fall below targets set by the ministry. SET-listed Delta Electronics Thailand, the maker and distributor of power management solutions and electronics components, plans to add new production lines this year at Bangpoo Industrial Estate, xpecting to get more orders from Chinese customers. The Bank of Thailand is demanding commercial banks discuss whether they intend to cancel physical passbooks in the future because it wants to ensure banks will offer proper services to customers. According to research from KPMG International, the fourth industrial revolution (Industry 4.0) requires transformational change at a pace the majority of manufacturers are not matching. The year 2019 will be a challenging year for over 300 Thai universities as they struggle with two major challenges.